The model and its information was utilized extensively throughout the building process in Easton Helsinki project. The project parties felt that design was same as modeling in this project and the model was also utilized extensively by the subcontractor. Furthermore, the owner utilized the model which advantages in decision making and developing the plans were taken to the customers as well. From the start, the objective of the owner was to create an as-built model for the maintenance of the building. Shopping Center Easton in the eastern district of Helsinki will be built in several stages. The first phase consists of building on top of existing supermarket and parking lot. 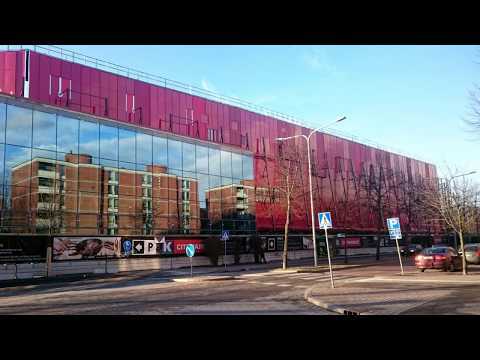 Valued at circa 100 million euros, the project was ordered by Finnish retail chain Kesko. The building will encompass a new K-Citymarket, other retail premises and two aboveground floors of parking. The gross area of the project is circa 65,700 m2, of which the first phase will encompass a floor area of 26,000 m2. The project utilizes a project management model by Haahtela, which includes direct supervision of building information modeling. BIM is widely recognized in the design program and exceptionally closely linked to scheduling. Design and construction overlap throughout the project; there have been many changes during the tight schedule. Design means modeling in this project. There are many challenges in a project of this scale, but model-based design has enabled effective risk management. Since the beginning, the client has aimed at creating an accurate as-built model to help in facility management. Developing the design and making decisions has been more efficient with BIM compared to traditional ways of working. Future tenants have been able to accurately envision their new operating environment and ensure dataflow back to the designers. Other levels of the project organization have also been able to speed up their decision-making. Thanks to advanced model-based design and use on site, many of the contractors have learned to know the benefits of BIM. In a tight schedule, design and construction overlap. The project has involved large changes in the middle of the design process. A model-based way of working has ensured fast design cycles and efficient transfer of input data. The building features a wavy double-skin facade consisting of 30,000 multi-colored ceramic bars supported by an undulating steel frame. There was no other way to construct this challenging structure but transfer accurate data between the architect, structural designer and workshop by using the model. Data transfer was successful and the end result as intended. Matching the designs, reviewing alternative solutions, hole reservations, installation checks and many other design tasks have been implemented by using the model. HVAC designer used VR glasses to check installation channels for piping in the engine rooms. Nine different design parties produced design data by modeling. BCF files and a cloud-based monitoring tool were used to manage communications in this phase. At best, the IFC models were updated once a week, ensuring fast information flow between the project parties. Transfer of input data for detailing the building units practically took place in real time as structural designers and detailers worked in Tekla Model Sharing model. On-site scheduling challenges were tackled in various ways. Alternative solutions for the frame were compared by using both Tekla Structures and Vico Schedule Planner and by utilizing the unit weights and locations in the model. This enabled safe assembly of the frame regarding the schedule and costs. Tekla simulations helped ensure installation sequence on a more accurate level and make the necessary changes. This way installations were able to continue non-stop throughout the project. The scheduling of the framing units was taken to unit level and entered into the shared model. Detailers, fabricators and installers updated the model with as-built data weekly so that project status could be presented visually. All project parties including the client appreciated the transparency that enabled quickly tackling emerging challenges. As a result, the frame was completed as scheduled and agreed. Model-based way of working has become a normal and natural method for the project parties. It is no longer seen as a separate part of the design process. The model has been the go-to tool when developing solutions, matching designs and meeting the challenges at the desk as well as on site. An indication of this is that designers have published more models than plan views. Workers, project management, supervisors, the client and end users have all utilized the models in various ways thinking outside the box. The models have helped manage project risks, learn and communicate about the project, follow and monitor the scheduling, manage the costs and install on site. BIM reliability and the requirement to do installations precisely as designed led the contractors to utilize the model to perform their tasks. Earth-moving contractor utilized the foundation location data from the model, the excavator dug the foundation levels without a surveyor standing in the pit, and the reservations for bottom drains fell right into their places. The as-built target has been reached thanks to perceiving the big picture including measurements and installation locations by viewing the model on mobile devices. Misalignments resulting in “red pen marking” were taken directly to the design by using Tekla Field3D on site. It was easier to show the designers what information was needed on site, which made it easier to allocate the resources. Using visualizations on site has significantly saved time when preparing for tasks and making fast decisions in challenging situations. The benefits of BIM are undisputable to the project parties. No traditional way of working would have enabled the same result.